When you want to become truly evil, you can't just go around snipping children's balloon strings and walk away laughing as they cry and the balloon hovers up to the sky. While that's truly mean, for sure, it's not exactly evil. 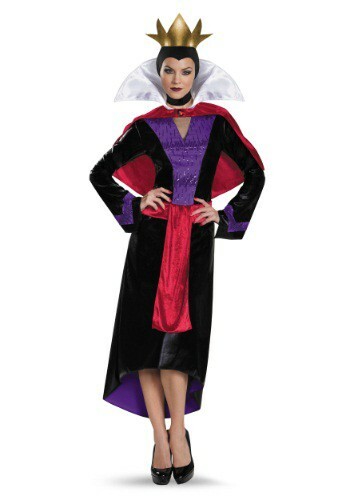 To do that, first, you need to get this Women's Deluxe Evil Queen Costume so you have the right look, and then you've got to learn how to poison an apple with an ancient sleeping curse and give it to the fairest maiden in the land. That's not the kind of thing they teach you on the food channel, but we think, if you're truly evil, you'll figure it out. Luckily, HalloweenCostumes.com can help you with dressing the part for this new villain gig. We've got you covered there!